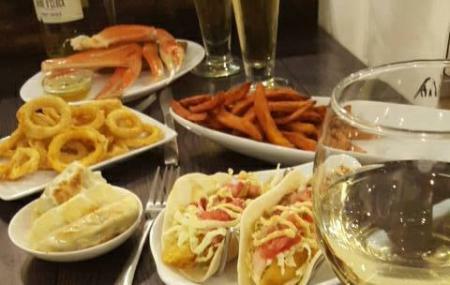 Find hotel near Joey's Seafood Restaurant ..
You will be flabbergasted by the tasty seafood that the Joey's Seafood Restaurants – Castlegar offers. The restaurant started its journey in the year 1985 and since its first day in the business, it never failed to deliver its customer with excellently cooked seafood. Fish and chips is the most preferred of many customers that this facility serves. The restaurant serves fish and chips using a variety of fish such as Haddock, Halibut, Pollock, and Cod. The other platters include fishes like Shrimp, Scallops, Crab, Salmon, Sole, Calamari and Mussels. Your little ones will be delighted to check out the special menu for the kids that includes dishes like Cheese Burgers, Corn Dogs, Popcorn Shrimp, French Fries and Coleslaw along with fruit juices. Make your visit suitable to your interest, use Castlegar trip planner for personalization. Add accommodation and hotels in Castlegar that suit your budget including the most recommended ones like Chameleon Hotel, Canadas Best Value Inn & Suites and Sandman Hotel Castlegar. There are plenty of ready-to-book Castlegar vacation packages available that will cover the major attractions, accommodation concerns including the prime one like how to reach Castlegar. Love this? Explore the entire list of places to visit in Castlegar before you plan your trip. Fancy a good night's sleep after a tiring day? Check out where to stay in Castlegar and book an accommodation of your choice. How popular is Joey's Seafood Restaurants - Castlegar? People normally club together Verigin Memorial Park and Cone Hill Park while planning their visit to Joey's Seafood Restaurants - Castlegar. Very good food and fast service. Very clear, and plentiful, gluten free options on the menu. Knowledgeable and friendly service. Highly recommended. Great food , Great staff and atmosphere to match. Awesome atmosphere, fresh, clean and super friendly, efficient workers. And the food is great! Thank you!